Don Roberto\\\'s Fruit Wine made out of mango stirred up the international wine industry and opened the door for more entrepreneurs to venture into tropical fruit wine making. Now you can find wines made out of coffee, duhat and bignay. The international market is the target of most wine makers in the Philippines. This project will show how to make wine using tamarind. STEP 1. Prepare the Tamarind Stock. 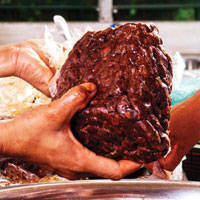 Because the tamarind bears fruit only once a year, it is best to make batches of Tamarind Stock that is good for a whole year of wine production. To make the stock, peel off the shell of the fruit. Mix each kilo of pulp with 5kg of rock salt. Pack and put in a cold dry storage. STEP 2. Prepare the Wine Starter. Make it two to three days prior to wine production. The starter is where the yeasts are being cultivated. a. Mix 3kg tamarind stock with 5kg water. b. 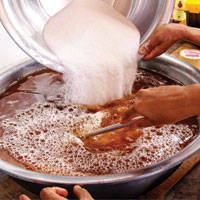 Extract tamarind juice thrice using a net and cheesecloth to remove the seeds and the pulp, respectively, until the extract becomes clear. c. Add 5kg water to the extract. d. Pasteurize and add 2.2kg of white sugar. e. Add yeast that\\\'s 0.02 percent of the total weight. f. Cover and set aside for two to four days to cultivate enough yeast. This would yield 10kg starter, which is enough to ferment 200L of wine.